There has never been a shortage of World War II stories coming out of Hollywood – PATTON tearing through the scenery of Africa, a rescue mission in SAVING PRIVATE RYAN, the weight of the Holocaust in SCHINDLER’S LIST, or the beaches of the Pacific Theater in LETTERS FROM IWO JIMA (the list goes on). 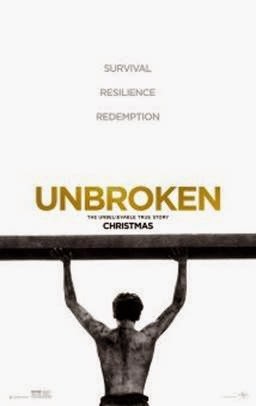 This year, Angelina Jolie directs the true story of Louis Zamperini in UNBROKEN, based on Laura Hillenbrand’s 2010 novel of the same name. Zamperini’s story is absolutely incredible, the kind of story that has to be told. He is inspiring, strong, and – though he is of Italian descent – oozes the American spirit. Zamperini was raised in Torrance, California with his Italian family where he is bullied because of his heritage. As a result, he embraces a loner lifestyle. Eventually Zamperini turns his anger into fuel, going on to be one of the best high school track runners in the country and eventually participating in the Olympics in Germany. On screen, the story cuts back and forth between Zamperini’s time as a runner and his service World War II, but UNBROKEN is mainly a story of survival and the human spirit. We watch Zamperenin lost at sea. We see him inside a Japanese prison camp and in a Japanese coalmine camp, toe to toe with death. Mostly unknown newcomer Jack O’ Connell (SKINS) plays Zamperini and he gives a tremendous and grounded performance. The kind of performance that may go unrecognized at award time, but should give O’ Connell a window into bigger opportunities going forward. The story is told through his point of view. We see the deeply religious but endlessly supportive family. The courageous men of World War II in situations of pure adversity. Through Louis we witness the boundless cruelty of Japanese captors, primarily Mutsushiro “The Bird” Watanabe (Takamasa Ishihara gives a chilling performance) who runs the Japanese camp and is particularly abusive to Louis, psychologically and physically. UBROKEN can sometimes feel tiring. At 2 hours and 15 minutes, it’s a bit of a harrowing viewing. Like many who served in World War II, what Zamperini experienced was relentless and you really feel it as you watch his story. Jolie proves to be a promising storyteller if she decides to continue directing. UNBROKEN also benefits from the vision of Roger Deakins (THE SHAWSHANK REDEMPTION, O BROTHER, WHERE ART THOU? ), one of the greatest living cinematographers. Through his camera, Deakins shoots a beautiful but authentic-feeling film.